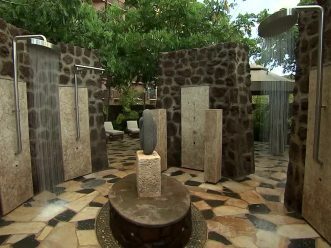 KO OLINA, Hawaii – From a rainwater suite to a unique outdoor hydrotherapy garden, “the gift of water” plays a starring role at the award-winning Laniwai at Aulani, a Disney Resort & Spa. The Hawaiian word “laniwai” (pronounced lah-nee-vai) means “freshwater heaven,” and the spa lives up to its name with more than 150 treatments, as well as Kula Wai, the only outdoor hydrotherapy garden on the island of Oahu. In particular, the spa’s design explores the cultural and even spiritual significance of “anuenue” or rainbows. By combining elegantly reflected light, brilliant color, and healing water features, Disney’s Imagineering team created a mystical aura. At Laniwai, guests are pampered in ways that enhance connections to nature and sets them on a path to personal enlightenment. With 18,000 square feet indoors and 5,000 square feet outdoors, the area includes a 2,000 square-foot Lift Fitness Cardiovascular Center, 15 treatment rooms and a full-service salon for hair, makeup and nail services. Also exclusive to Laniwai is Painted Sky, Hawaii’s only teen spa. 15 treatment rooms, including a couples room and a flex room for treatments for two-plus guests, including families. Treatments include signature lilinoe (fine rain), herbal body remedies, massage therapies, vitality baths, facials and skin boosters. Signature Lomilomi: In the traditional Hawaiian massage, gentle, rhythmic pressure relieves tension and promotes healing. Our Signature Lomilomi adds the uses of soothing Lomilomi sticks and warm river stones to help you achieve ultimate relaxation. Kilikili: Pairs exfoliation and massage with coconut oil under streaming jets of warm waters. This treatment takes place in Lilinoe, our private rainwater suite. Dressing rooms for men and women include eucalyptus-infused steam, dry sauna and relaxation room. There is also a separate space for co-ed relaxation. With ‘Ohana Means Family, a special massage experience is designed for three to six family members (ages 5 and up) and utilizes the healing touches of lomilomi sticks. Other specialty treatments are designed especially for expectant mothers and new moms, as well as couples. As the only outdoor hydrotherapy garden in Oahu, Kula Wai is entirely dedicated to relaxation and restoration of the body. The 5,000-square-foot garden retreat offers pampering amenities, including private vitality pools, co-ed mineral baths, a reflexology path, six rain-style showers, whirlpool jet spas and a lounge area with a menu of healthy foods and beverages. In addition, guests have the opportunity to blend their own body polish at Pula Bar, the mixology station. Guests can enjoy complimentary access to Kula Wai with the purchase of any full-service spa treatment. Exclusive to teens ages 13 to 17, Painted Sky is the only teen spa in Hawaii where teens can relax and make new friends. The 1,500-square-foot retreat offers age-specific spa treatments, activities and more. Painted Sky amenities include an acai and yogurt bowl bar, relaxation area, computer station and D.I.Y. (Do It Yourself) Iliahi mixology bar to blend personalized Hawaiian body polishes, perfume and face masques. Laniwai’s full-service salon houses four manicure stations, four pedicure stations and two hair stations. In addition, grooming treatments are available for men. Magical makeovers—the keiki wahine experience—are also available for kids ages 3 and up. Fitness Center is open 24 hours for resort guests. The state-of-the-art, 2,000-square-foot health club features Life Fitness cardiovascular and strength training equipment, a Kinesis machine, free weights and a stretching area. For guests interested in a personalized workout session, expert, certified trainers are available to customize a program to meet your fitness needs. Fees apply. Fitness classes include yoga, spinning, beach workouts, aquatic exercise, meditation and tai chi. Each class is led by a member of the fitness team at Aulani. Aulani, a Disney Resort & Spa is perfectly positioned on 21 beautiful oceanfront acres of Ko Olina on the leeward coast of Oahu. Just 17 miles from Honolulu International Airport and approximately 30 minutes from Waikīkī, Aulani Resort features 351 rooms, including 16 suites, and 481 two-bedroom equivalent villas, including 20 grand villas. Guests are invited to experience its world-class spa, restaurants and lounges, pools, kids’ club, and more—all uniquely designed for families to discover the culture, history and traditions of Hawai’i. Aulani was voted the No. 1 family beach resort in the Travel + Leisure World’s Best Awards in 2016. For more information and reservations, visit www.disneyaulani.com or call (866) 44-DISNEY.